Students deserve to know what the British Empire did, and learning about Winston Churchill’s true character is the perfect place to start. At my school, a cardboard cut-out of Winston Churchill stands in the history corridor right underneath a security camera. Winston Churchill, the white supremacist, the “war hero”. And so when it came to brainstorming the ways we, a number of pupils from year 10, could make an objecting statement, vandalism was out of the question – Big Brother is always watching. Instead, we wrote a letter. Winston Churchill, the prime minister who led Britain to victory in the second world war has long enjoyed legendary status. His success in suppressing Nazism means that today he is an exalted historical figure who is fiercely protected not only by the average Briton, but also by the institutions that govern the country. However, the truths of his sinister, chauvinistic mindset when considering empire are too often swept aside, not only by the media, but crucially, also by the British education system. It may seem overboard to go to the trouble of writing a letter solely in objection to a sorry piece of cardboard right before the summer holidays. After all, many significant figures in history have tainted legacies. But the whitewashing of Churchill’s legacy in particular is incredibly problematic. He not only spouted racist nonsense, but such a way of thinking allowed for the deaths of millions, such as in the Bengal famine of 1943, on which he once proclaimed, “I hate Indians. They are a beastly people with a beastly religion” – something our curriculum failed to teach us. His regressive, extreme nationalism also lead to a preventable famine, one of the many atrocities of British colonialism that is being erased from curriculums today. His presence in such curriculums exemplifies a wider problem. And so, a letter addressing the head of the history department demanding the removal of the cut-out and questioning why it was there in the first place was anonymously placed on a desk. We suggested that a more transparent history be taught in the years where, being an independent school, they are at liberty to decide the curriculum. 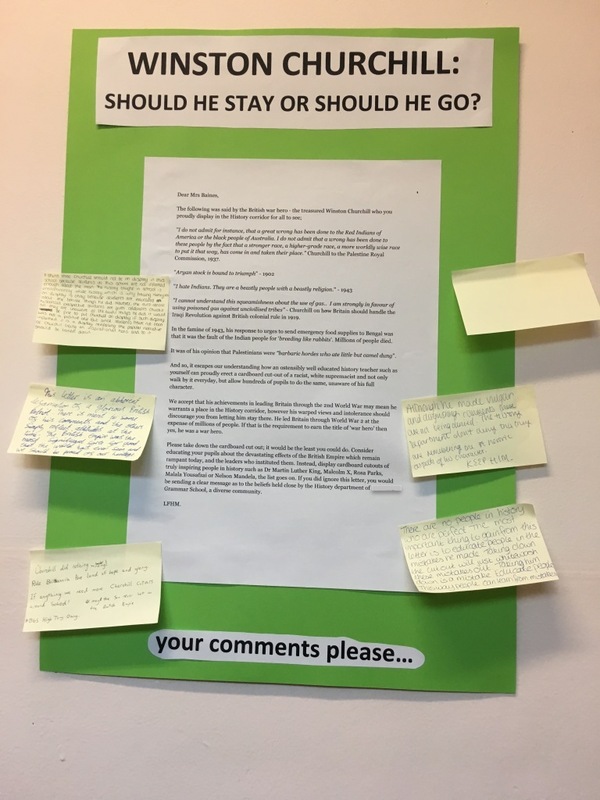 Not long after, on a Wednesday afternoon, en route to my history class, I saw a glaring green poster emblazoned with the words “WINSTON CHURCHILL: SHOULD HE STAY OR SHOULD HE GO?” The Churchill Letter had made a grand appearance, alongside the instruction “your comments please” and a stack of post-its. The head of history seemed to want to open a conversation several people felt very passionately about, judging from the Twitter-mob-like commentary left after only a couple of hours. The responses were loud and unwavering. “This letter is an abhorent [sic] defamation of a glorious British patriot. There is merit to some of his comments…’’. I presume “his comments” include his views on India, using poisoned gas against “uncivilised tribes”, and being partly responsible for the Bengal famine among many other atrocities. This particular post-it went on to announce that, “the British Empire was the greatest force for good the world has ever seen”. The most infamous post-it note by some margin came courtesy of BGS High’s (my school) Tory Gang: “Churchill did nothing wrong! Rule Britannia the land of hope and glory. If anything we need more Churchill cut-outs around school! #may the sun never set on the british empire. #BGS High Tory Gang”. A single friendly note featured on the history wall, noting that unless the history department were willing to appropriately educate their students, the cut-out was only perpetuating a false narrative, so it should be taken away. At the end of the day, we deserve a transparent and thorough education. This must include the difficult aspects of Britain’s legacy, because continuing to omit cruelties from syllabuses, such as our ignored role in the Trans-Atlantic slave trade, will continue to do a disservice to the victims of these exploitative regimes. How many adults, let alone school children, would have the foggiest clue that of the 12 million slaves abducted from Africa over 400 years, at least 40% were transported in British ships? Or that at the point of abolition, Brits owned roughly 800,000 slaves in the Caribbean, valued at £47million? Even a basic knowledge of these topics would help to better understand current world affairs, which too many of my peers are completely unaware of. The despicable mistakes of western powers need to stop being relegated to footnotes. And if reparations won’t be paid to the actual slaves of the slave trade or to Britain’s ex-colonies, then at least educate the future leaders of this country about what mistakes were made so that they can never be made again. Like any mention of Britain’s abhorrent colonial past, the poster was taken down the next day after other history teachers complained. One teacher in particular had viewed CCTV footage to ascertain who dropped the letter off in the first place, and called me in to her office to ask why I’d done it – as if it needed explanation. The issues we tried to raise never reached more than a few students. Later, however, we participated in the History Society’s “Churchill Debate” on whether Winston Churchill should be lionised in the 21st century, reaching no consensus. But I’ve just started the new academic year and cardboard Churchill has been moved to a classroom. While curriculums continue to be tasked with perpetuating the facade of Britain’s squeaky clean past, idolising figures such as Churchill will always be seen as controversial. It needs to be realised that an honest education is a vital, alternative form of reparation which much must be paid. Imaan Haider is a GCSE student from Bradford. She enjoys reading, spending too much time in the school library. She doesn’t currently tweet.